Indulge yourself with this simple three-step system that will leave your hands as soft and smooth as velvet. • 8 Piece(s) 04 oz Natural Malibu Tottle 22/400 1.5"
INCI Ingredient Label: CUTICLE OIL: Apricot Kernel Oil, Rose Hip Oil, Camelina Oil, Jojoba Oil, Vitamin E. HAND POLISH: Sugar, Coconut Oil, Water, Ammonium Lauryl Sulfate, Glycerin, Disodium Cocamido MIPA Sulfosuccinate, Cocamidopropyl Betaine, Propylene Glycol, Acrylates/C10-30 Alkyl Acrylate Crosspolymer, Disodium DMDM Hydantoin, Fragrance. HAND LOTION: Water, Cetearyl Alcohol & Ceteareth-20, Helianthus Annuus (Sunflower) Seed Oil, Glyceryl Stearate, Polysorbate 60, Propylene Glycol, Diazolidinyl Urea, Methylparaben, Propylparaben, Petrolatum, Carbomer, Stearic Acid, Isopropyl Palmitate, Allantoin, Disodium, BHT, Benzophenone-4, Fragrance. Place small mixing bowl or measuring cup on scale and tare. Weigh each oil: 1.2 oz. Apricot Kernel, 1.2 oz. Rose Hip, 1.2 oz. Camelina, 0.36 oz. Jojoba and .04 oz. Vitamin E.
Mix well and fill all 8 - 15ml. Clear Plastic Roller Bottles, cap and set aside. Place large mixing bowl or measuring cup on scale and tare. Weigh 25.6 oz. Granulated White Sugar. Weigh 8.55 oz. Liquid Suspension Soap Base and tare scale. Weigh 8.55 oz. Coconut Oil 76°. Whisk together the liquid suspension soap base and coconut oil. Add 26.5 mls. fragrance and whisk to incorporate. Add sugar to liquid soap mix and whisk to incorporate. Transfer hand polish mix to a Ziplock bag or pastry bag for easier filling. Empty both 16 oz. jars of head to toe lotion into large mixing bowl or measuring cup. Heat lotion in microwave for 1 minute. Remove and mix to evenly distribute heat. Add 1oz. Fragrance and mix well to incorporate. Transfer hand lotion mix to a Ziplock bag or pastry bag for easier filling and fill all (8) 4oz Standard Malibu Tottle Bottles and cap. 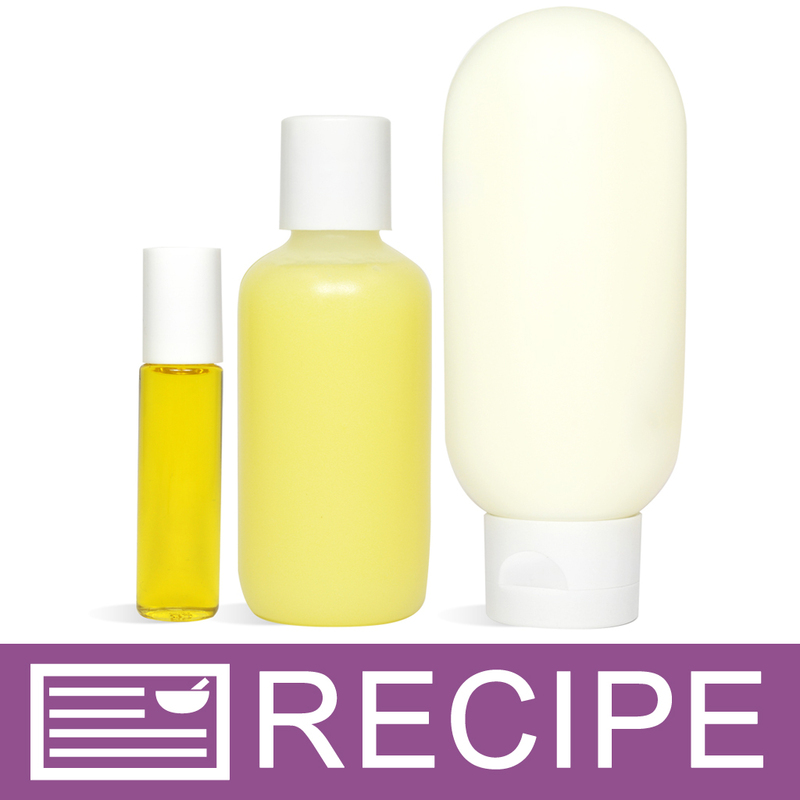 Place one each: Cuticle oil, hand polish and hand lotion in an organza bag. Attach label and repeat until all (8) bags are filled. We recommend a hang tag but you could also label each individual item if you prefer. Use the Silky Soft Hands Polish to cleanse and scrub all at once. It removes dead surface cells while instantly leaving hands feeling soft smooth, and looking healthier. Use the Silky Soft Hands Cuticle Oil to re-hydrate and protect your cuticles. Complete this pampering experience by applying the Silky Soft Hands Lotion to seal in moisture and provide a protective barrier for lasting results. "If I'm using an All Natural Suspension Body Wash with added Carbopol Polymer (Ultrez 20) (Suspension agent) that dose not have a preservative in it which one would I use? Also will adding Polysorbate 60 act as a suspending agent in this type of formula and will I need it for the purpose of a solubilizer & stabilizer of essential oils? -Kara M"
Staff Answer You would use any of the water soluble preservatives such as: Optiphen ND, Optiphen Plus, Germaben II or Germall Plus. You would have to test the Polysorbate 60 to see how it reacts in your product. "If you don't use a micro-wave, what temp would you heat (double boil) lotion to?"